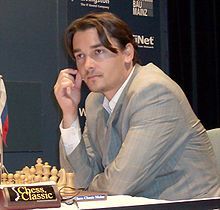 In the same year he participated in the FIDE K.O. world championship played in New Delhi. Due to his rating he was seeded directly into the second round in which he eliminated Milos with the score of 2-0, then he proceeded to beat Evgeny Vladimirov 1½-½ in the third round before finally being eliminated in the fourth round by Vladislav Tkachiev.